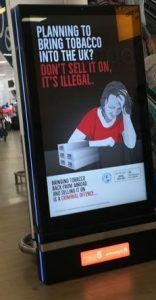 The Tobacco Manufacturers’ Association (TMA) has launched a major nationwide advertising campaign to help fight the scourge of illegal tobacco. 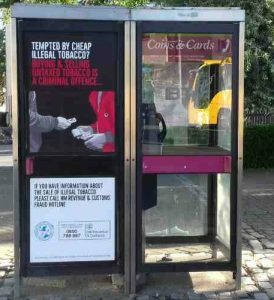 Posters will be displayed on phone boxes in 50 illegal tobacco hot spots across the UK, so those tempted to either buy or sell cheap illegal tobacco are warned of the consequences. The campaign also encourages those who are aware of illegal tobacco, but don’t buy or sell it themselves, to report any suspicious activity to HM Revenue & Customs who will investigate further. The campaign will also be appearing at the UK’s busiest port and various airports to remind adults who bring tobacco back from abroad that it is illegal to sell it on without paying UK taxes. This campaign has been developed following research which has found that many adult smokers are unaware of or simply disregard the law. This campaign will therefore ‘nudge’ smokers away from the illicit market by reminding them of what is legal and what is not and raise awareness of the HMRC illicit trade reporting hotline. Posters have been put up 50 locations in Cardiff, Glasgow, Perth, Dundee, London and Manchester. The TMA’s Ports campaign has billboards at Dover international sea port and the following airports: Glasgow, Glasgow Prestwick, East Midlands, Manchester, Cardiff and Belfast. Illegal tobacco is a major social problem. According to HMRC, it cost the government £2.5 billion in lost taxes in 2016-17 which in turn puts important public services at financial risk. Moreover, it brings crime into local communities, hurts small independent retailers and the profits from illegal tobacco have been known to finance terrorism and organised criminal gangs. It has been estimated that the sale of illicit tobacco made criminals more than £1.5 billion and cost the small retail sector more than £1.7 billion in revenue. “The tobacco industry is committed to helping fight the illegal tobacco market which impacts communities, public services and small retailers.